This article addresses older Rhino Version 4 trouble. When Object Snaps (Osnaps) are on and you hover near a snap point, the display should show which snap is active (with a word like End or Cen in a little box near the cursor). In certain installations, this tooltip is distorted or unreadable. Typically people report seeing a square box with a fuzzy or garbled display of pixels inside. Right-click on the desktop, choose Properties, go to the Settings tab, click the Advanced button, go to the Troubleshoot tab and move the little slider one or two clicks to the left. The problem should go away. This has to do with the graphics card, drivers used, and your OpenGL settings. It generally only happens when using hardware accelerated OpenGL, and is most often reported in conjunction with ATI graphics cards and drivers. 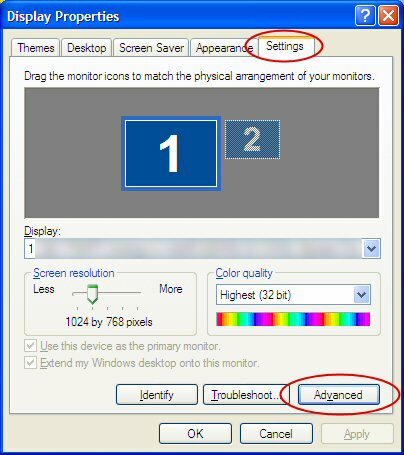 Moving the slider to the left one or two clicks removes the mouse cursor acceleration (without affecting the rest of the hardware acceleration). In most cases, this seems to fix the problem. Note: There may be some cases where the above method does not work or will not be possible. See the bottom of the page for another way to fix this (Rhino 4 only). 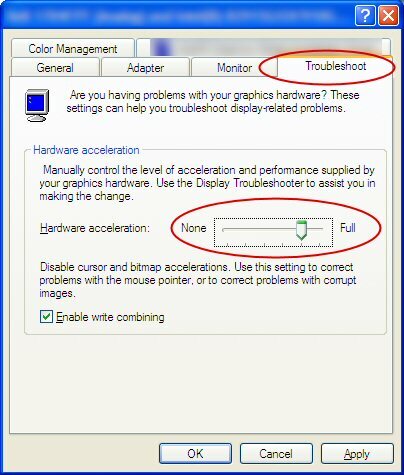 Moving the slider to the left one or two clicks removes the mouse cursor acceleration, but not the rest of the hardware acceleration. In some cases, you are not allowed to change the slider indicated above. It will be grayed out. For example, a low-level user on a network might not have privileges to change display settings. Go into Rhino Options > Modeling Aids. In the Dynamic Object Snap section, check None. Before exiting Options, go to the Cursor ToolTips section (a sub-category of the modeling aids section) and check the top box Enable cursor tooltips. Afterwards, check Osnap, then OK to exit Options. You should now have a working osnap onscreen display. The cursor tooltips use a different display method, and are not affected by the same OpenGL problems outlined in the first section. If there are still problems, report these to the Rhino newsgroup or tech support.